Earlier this month, Josh Hamilton became the 16th slugger to mash 4 homers in one game, a feat that sits between perfect games (21) and inside-the-park grand slams by a catcher (12) for rarity. Hamilton called it his biggest baseball thrill, other than playing in the World Series, and I can believe it. For all Hamilton's batting excellence, two men in MLB history have gone deep 5 times in one day, thanks to doubleheaders: Stan Musial and Nate Colbert. We're close to the 40th anniversary of Colbert's August 1, 1972 assault on the Atlanta Braves, which also set RBI (13) and total base (22) records. See the record-setting ball and hear Nate talk about the game at Seth.com. Artist Robert Laughlin included this artful appreciation of Nate's power in his Diamond Jubilee set, made to honor the National League Centennial and American League Diamond Anniversary. I've always enjoyed the set's bright colors and it's worth picking up if you like 1970s oddballs. 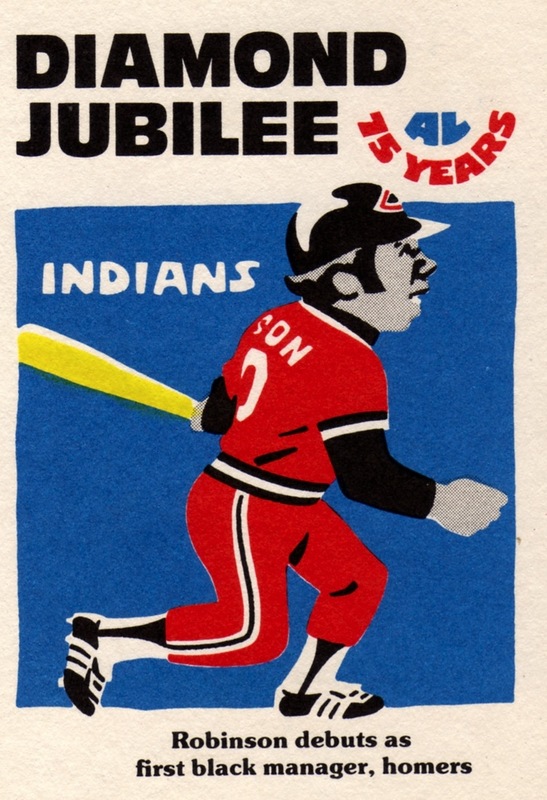 Frank Robinson's own unique accomplishment as baseball's first African-American manager appeared as 1976 Laughlin Diamond Jubilee #5. I hope he would've made the set regardless of that homer, but it added some oomph to the headline. MLB.com has it own feature on Nate Colbert and Jackie Robinson, complete with highlights of their encounter and a Bob Costas-narrated video of Nate's big day at the plate. 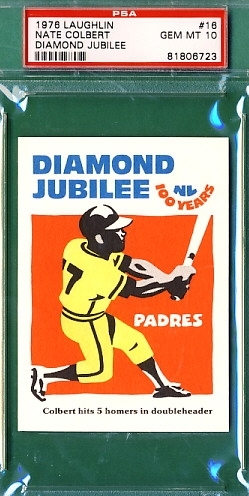 Anyone know if San Diego plans to honor its anniversary this year?